Paula Fass’ new book The End of American Childhood is a history of childhood and parenting from the nation’s founding to the present. Fass, a University of California-Berkeley history professor, reveals how our values of independence, self-definition and success have affected our attitudes toward child rearing. The excerpt below comes from a chapter on the rise of parenting expert in the early 20th century. It discusses how new scientific expertise (some wise, some wrong) changed American parenting. Parents today are well accustomed to getting various kinds of “scientific” advice, and like their predecessors in the 20th century, that advice can cause them worry and confusion. The idea of development — that children can be expected to follow certain yardsticks as they mature — continues to be an significant part of what they learn from parenting experts like pediatricians and psychologists. With this fourth D—development—twentieth­ century experts had a basis for measuring babies’ progress through various childhood milestones. Now that babies were expected to survive, mothers would begin bringing their physically healthy babies for exacting observations regarding progress in mental, psychological, and cognitive areas as they wondered whether their language, emotions, and social interactions were age­ appropriate. Age distinctions became more and more of a yardstick in the period, affecting ideas about learning as well as development. (32) Where Emmett Holt provided weight charts, Arnold Gesell provided measuring sticks for the first months and then years of a healthy, surviving child’s life. It was a brave new world. In this world, it was almost as if parents and experts had made a pact, financed by new foundation money, to create a modern child­hood at just the time when the century­-long decline in births was making families much smaller. I have suggested that the late nineteenth century saw a reinvigorated emphasis on family life. But instead of increasing the number of children it raised, this renewed family emphasis did the opposite. The middle class, especially (and others to a lesser degree), significantly reduced the number of children in the household, from the average of four or five before the Civil War to two or three by the early twentieth century. This was a dramatic demographic change inscribing a change in behavior that alerts us to several important matters closely related to the turn to expert advice. First, some of the ability to change birth patterns resulted from the reliance on medical devices and expertise, made available to middle­class women by doctors. (33) Second, the desire to have fewer children was not simply a desire to cut down on the cost of childrearing. Instead, the cost of rearing each surviving child more effectively became a powerful incentive both to reduce the number of children and to turn to whatever had become available to ensure that children survived and prospered. Thus child survival and child nurture reinforced each other as expressions of reduced fertility and reduced mortality. Both were responses to the heightened commitment to childhood and to family life. More carefully reared children, better child survival, and more effective use of birth control all point toward a new emphasis on control within families. This also had significant consequences for how Americans’ traditional commitment to children’s independence was understood and refashioned. 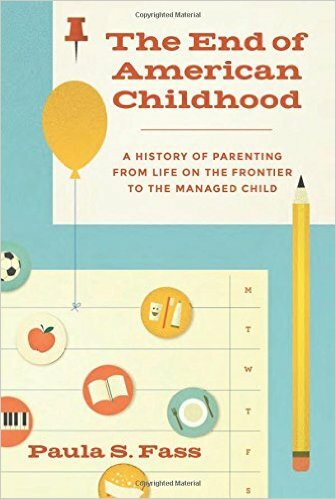 From: The End of American Childhood: A History of Parenting from Life on the Frontier to the Managed Child, published by Princeton University Press. Reprinted by permission. Many of you have written to me over the years suspecting some connection between fewer children and more helicoptering. Fass sees that connection, too. And you might recall that Fass is also the author of Kidnapped: Child Abduction in America, which traced the history of that particular crime from its ransom-raising origins through the Lindberg baby up through Etan Patz, and how each of those iterations changed how we view children and safety. That’s how I first met her. It is all a knot: Fear, experts, science, media, money, mortality and the march of time. Kudos to Fass for tackling such enormous issues and recognizing that parenting is a legitimate field of history. I really don’t get why there are Women’s Studies departments, and Gender Studies, and this and that studies, but not Parenting Studies, considering the importance of that topic.- L.
By my friend and inspiration, UC Berkeley Professor of History professor Paul Fass. Does she think there could be a relationship between smaller families and mothers’ feelings that they need experts? I sometimes wonder if, not being raised in a large family and with extended family close by so kids grow up being responsible, at least part of the time, for younger sibs, cousins and nieces and nephews, had some effect on moms’ reliance on experts. I definitely think having multiple children makes it nigh impossible to be a helicopter parent. I’ve got four, and most of my parental attention goes to the two-year old (who also has hearing loss and is just starting to recognize sound due to her cochlear implant). The 7- and 5- year olds are free to roam about our little street, and I simply cannot hover over them. My mother, who is about as neurotic a human as you’ll ever meet, even was fairly laissez-faire in terms of just letting the kids do their own thing, and I think that in part stems from having 5 – although she was like that with me, and I’m 12 years removed from my closest sibling. On the flip side, of course it does not follow having one or two means who will be a helicopter parent, and many parents I know who have 2 or less are fairly free range. It just is more difficult to be one when you have multiples. I don’t have any children myself but regardless, I would agree with you 100% Paul when you say it’s difficult to be a helicopter parent when you have multiple children, especially 4! Now to me, it would be a good opportunity for parents to train and to trust their older children to watch and help nurture their younger siblings, especially if both parents are working to support their larger than normal family. Older children taking on a prominent role in raising their younger siblings is very common in developing countries but is frowned upon in America. We have this “parents are 100% responsible for their kids” mindset and it seems as if multiple children families are not a good enough reason to most Americans, including the legal system, for parents to offset some of their responsibilities onto the older children. Now as far as I’m concerned, it’s common sense. 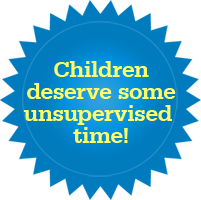 Not only does it relieve some of the pressure off the parents but it enables the older kids to learn responsibility when it comes to caring for younger kids. Now I think for the most part American families with many children (4 or more), which is not very common in America anymore, have figured this out. They basically don’t have a choice! I don’t think it is that uncommon at all for the older siblings in large American families to take more of a proactive role in raising their younger siblings more so than we think. BUT THE PROBLEM IS, as soon as something bad happens such as the younger child getting hurt under the cognizance of their older sibling, the American legal system cracks down hard on the parents. Now as far as I’m concerned, this is what has got to stop! Then to make matters worse, “It was the parents’ responsibility and they shouldn’t have had so many kids if they couldn’t watch them! !” is the crass and unforgiving attitude taken by most Americans judging the situation. You all saw it first hand on the blogs with the situations involving the gorilla and alligator. People were cruel and relentless but completely oblivious to the fact that they were judging the situations with the full benefit of hindsight! Interesting but does the author consider the rise of the infant bottle formula industry and its corrupt influence on the American Academy of Pediatrics and other obstacles to selling inferior infant bottle formula? From what I recall growing up in the 70’s and 80’s, parents (family, extended family, and family friends) it was more about trial and error. Based on their own upbringing. They tried to make a carbon copy of how they were raised, and when some of those didn’t work (as often the case between generation gaps), they tried something else. A little modification from what they learned as children. Until they found what worked. And then enforced it. There was never any negotiations. As kids, we fully understood what our parents said GOES. Or we faced consequences. Which is exactly how I raise my kids. I’ve had to modify some of the things that worked for me. Getting with the times and society, but holding on to core values and ideals. Like being respectful, thinking before acting, the golden rule. These have been taught to them since they were no older than 2. And I find it easier to teach them about how the world works. How to navigate THIS day and age, with all the new distractions, and trends that seem to manipulate your young children to their needs. I’m glad my kids understand their needs come from their parents. Not some celebrity online, or sheeples. Right on Michelle. Parents these days don’t seem to understand that simple mentality. They can step back a little, make time for themselves, and their children will be just fine. But it has to start very young. Get them used to what they need to know, so that you’re not struggling trying to make them understand long after they’ve gotten used being enabled and spoiled. Very true. I’m from a family of 8, and I used to teach English literature in high school. We were reading a novel about a very large family (Gabrielle Roy’s “The Tin Flute”) and I and the one student in the class from a large family were trying to explain to the rest of the class that it was possible to be in a large family without being neglected and unloved. To the rest of the students, it was simple mathematics: divide the parental attention they got by X = amount of love per child available in a large family. Both my student and I tried to explain the multiplier effect of having many siblings, and the way large families generate a life of their own that is not all about parental input, but to no avail. The 2-child family kids simply couldn’t picture what we were describing. Milestones are important for health reasons. Now we should not get crazy about them but if a milestone is late or not showing up it time to check it out. Hooray to Fass for writing this book. I loved the Kidnapped book. I found it totally fascinating. It’s been a puzzlement to me for a decade, what happened between my own childhood and the birth of my kids that made what had been de rigeur in the 70s utterly taboo in the 2000s. Because it all seemed to happen at once. But Fass is indicating that it was a longer slide. Was tempted to become a sociologist just to try to tease this apart myself. It seems enormously important to look at this, understand it, and change course. As a family therapist, I feel like a student of parenting every day, both at home and at work. Melvin Konner wrote a book titled Evolution of Childhood. He is both an MD and an anthropologist, fascinating combo. It’s a tomb, but I am slugging away. Some might find it interesting. Thanks for the broad expanse of info that you continue to put out. The more open we are to new (and old) ideas and thoughts the better our thinking becomes. I was the youngest of 10. It wasn’t so much empowering growing up in a large family as a feeling of having our own little tribe. We needed to work together, not be managed. My parents were loving, but they also gave tremendous responsibility to my older siblings to help raise the little ones. I remember peeling potatoes on a kitchen stool at the age of 3 or 4 with my second oldest sister- I was *her* baby. Today, I see teenagers that were my sister’s age with their own babysitters to drive them from activity to activity. My sister rode me around in the basket of her bike! I hate the term *managed* child. We used to celebrate children hitting milestones early, yet childhood independence is now frowned upon and is seen as neglect. Why is that? I also prefer a more laid-back parenting style and think it depends on the individual child (each of my kids has different needs for attention). It’s all about circling this vortex of parenting, not getting sucked into the dark hole of over-parenting, and getting guidance on good parenting practices from people you trust who don’t have financial gains or ulterior motives. my family is fairly big. I have three younger siblings. as a teen, it was often up to me to get them to the park or ice cream shop and back safely, if we wanted to go and were willing to walk. people are way too protective today. oh, by the way, that wasn’t that long ago (im only 21). Large families. ..wonderful! Reminds me of a whole year group statistics project we had to do way back in 3rd form, on family size. Usually pretty boring stuff. …we mostly came from 2-4 child families. One lovely girl we all thought was cool, though, just kept whispering when it came her turn. Her family? 21! We learnt a valuable lesson about outliers, and how it’s possible for 1 person to scew graphs ☺. I’m so glad we got off of the constant-need-to-entertain-our-kids treadmill. We can ALL have fun on vacations. They are fine getting bored (and sleeping their tired bodies). They don’t need to go to an SAT prep course or another expensive sports camp. I need them to fold this laundry!! Ever since 1939, a high standard of life has been replaced by a high standard of living. Children growing up in the 1930’s did not have too bad a time. Children in that decade climbed trees, played hide-and seek, and other informal games. They jumped rope, and played hopscotch and jacks. Where I lived in the southwestern Part of Vancouver City were seven girls. They’d be exploring the neighbourhood from the time they could walk. I came from a family with 6 kids, which means I had the opportunity to watch and learn and practice childcare within my family. Also, free ranging meant that I saw more of what other families were doing. Having many babysitting jobs starting at age 10 helped too. So when I embarked on parenthood, I didn’t seek advice from anyone; I had experience as well as instinct to draw on. I feel sorry for my kids since they won’t have a chance at similar experience. But there’s more to it than that. Today many people are afraid to trust their own parents / extended family when it comes to parenting ideas. Modern psychology has convinced many that their parents did everything wrong and “screwed them up” and are terrible examples to follow. Thus people are more willing to listen to a stranger who never met their child vs. someone who would probably die for their child. I find it very strange and sad. As far as trusting our own instinct, I am not really sure why people fear that. Something in the way the media advertises what horrible things can happen to us if we don’t cover all the bases? Or the idea that one poor outcome means we can’t trust ourselves with anything? Or maybe just the fact that nobody gives lip service to mom’s instinct when a mom is preparing to welcome a child. Maybe the way “experts” including doctors laugh and sneer when the parent’s idea is different from theirs. I don’t know. I didn’t have those problems because I was old and crotchety when my kids came along. When a doctor laughed at me, I simply quit seeing him.